You’ve spent months researching and searching for the perfect gun. Also, you’ve visited countless websites, gun shops, and even some firing ranges to try out the ones you seem to be gravitating towards. 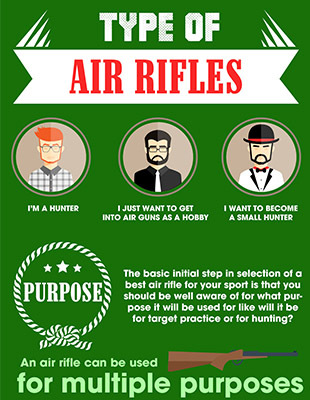 You’ve decided to take the plunge and you’ve decided on a gun that you feel will suit your lifestyle and needs. Before you go ahead and make your purchase, please be sure to exercise the same due diligence in finding the perfect holster. Yeah, I know. You’d forgotten about that in the excitement of finally being able to buy your dream gun. Don’t worry, you’re not the only one to “jump the gun”, (or is holster?). Many people make holster selection an afterthought and end up with holsters that are uncomfortable and not easy to draw from. A poorly designed and ill-fitting holster can even lead to you losing your gun in a skirmish. This is why when you are researching your gun of choice. Make sure to research holsters that will be suitable for you. Holsters like the Urban Carry holster. Now that’s a great holster, and I think an Urban Carry holster review is in order. But before we go down that road, let me just talk about how you should go about choosing a holster. 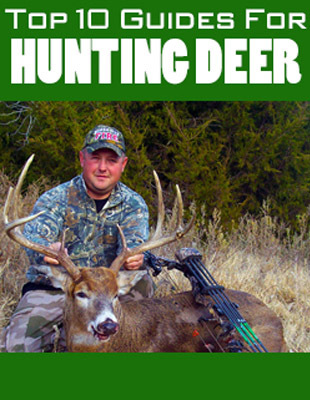 Click here to read about Why Gun Safety Is Important. Let me reiterate, a gun holster should not just be an afterthought after purchasing your gun. It should also take priority just as your gun does. Here are some things to consider as you go on your holster hunt. Each of these holster types has its own advantages and disadvantages. You should be careful in your search for the best gun holster. Another factor to consider when choosing a holster is to decide on the material you prefer for your holster. And no, this is not just a fashion statement as you will soon see. Even though fashion is something to give a little thought to here (it doesn’t hurt to look good does it?). Most holsters are from one of 2 materials - leather or thermoplastic. Each of these 2 has its own advantages and disadvantages besides the look factor. Leather holsters are typically more expensive than their plastic counterparts. Yet, they have the major advantages of lasting longer than plastic ones. They provide a great fit and comfort as they are more pliable. The thermoplastic holsters major drawback is being prone to warping if left in the sun for a long time. They have their advantages too like if you need to have a tighter grip in areas such as the trigger guard. The thermoplastic holsters do that better than leather holsters. The biggest advantage of thermoplastic holsters though is the added security. It comes with the “click into place” feature that most models have. The size of your gun is another major determinant of your choice of holster. Although it’s true that many holsters are designed to accommodate several similar sized weapons with ease, that doesn’t mean any holster is truly a one size fits all holster. For example, holstering a .45 in the same size holster as your Glock can’t work as your .45 is way smaller than your Glock and there will be big gaps that will defeat the purpose of securing your gun. So as you search for a holster, make sure it’s compatible with the gun you are buying (or already in your possession if you already own a gun). Now that you know what to pay attention to as you look for your first (or next) holster, I think we can make sure to continue with our Urban Carry holster review. Spoiler alert: you will definitely love this holster as it has a few tricks up its sleeves. One thing you need to remember about a holster is that it’s the main interface between you and your gun. And as such, holster selection needs to be the next highest level of care after your gun. Because it is right next to your body, it also has to be as comfortable as possible. That’s why you need to consider the Urban Carry holster. It is one of the best-concealed carry holsters on the market at the moment. Let’s quickly run through its main features before you rush off to purchase it and your gun. Urban Carry holsters are well designed and made from the finest saddle back grade leather in the world. 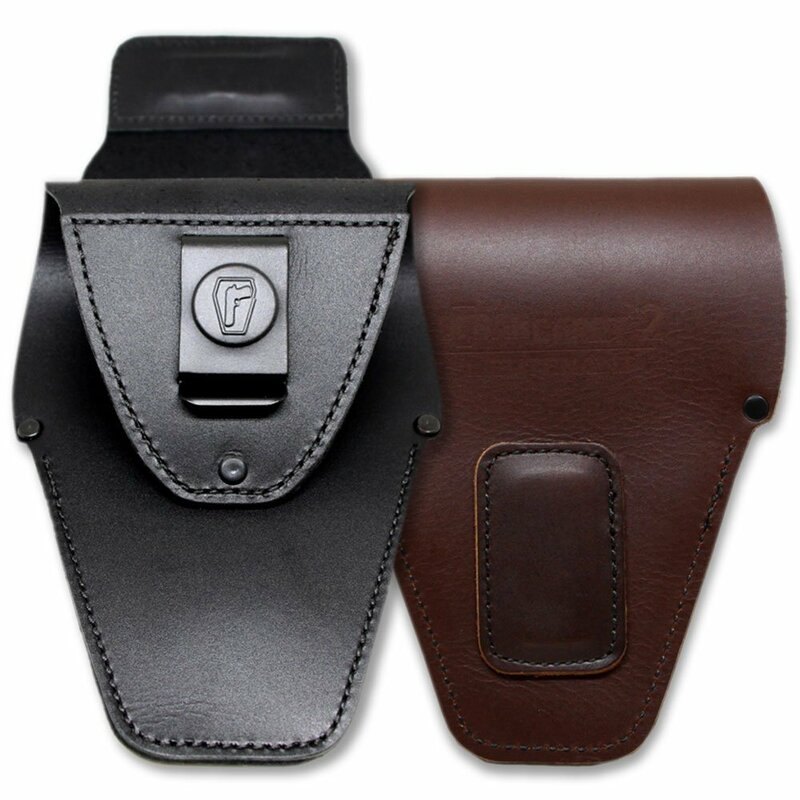 Not only is the leather premium, but the stitches that hold the holster together are also of the highest standards, giving you a very sturdy holster that will definitely last for a couple of generations or more. And yes, the Urban Carry holster is made in the land of the free and the home of the brave - the United States of America. One mistake many people make upon buying a leather holster is to think the holster will be comfortable right off the bat. Not true my friend. You will have to break it in before you appreciate the softness, comfort, and contouring of a leather holster. Get a conditioner and take your time to work it in your new leather holster. After a couple of days, the holster will feel like a dream. The Urban Carry holster is definitely a premium grade holster that will definitely compliment you while at the same time enhance your confidence due to its robust and yet discreet design and Build. The Urban Carry holster is the true definition of concealed carry. In fact, it acts more like a hidden pocket where your pistol sits safely and securely beneath your belt line under your pants. 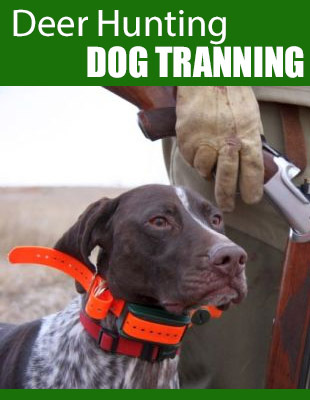 The holster is attached to a heavy duty belt and has a flap that extends over the top. A hidden pocket is an understatement as the Urban Carry has so much room you could call it a purse, and yet you will hardly tell that it is there as you go about your daily business. When in place, the part of the holster that holds on to your belt looks like a cell phone pouch, further aiding you in concealing your weapon by disguising the holster. As I’ve already mentioned, the Urban Carry holster is so comfortable you won’t even tell it and the gun it contains are there. One of the major contributing factors to its comfort is the fact that is made of leather, making it very flexible. 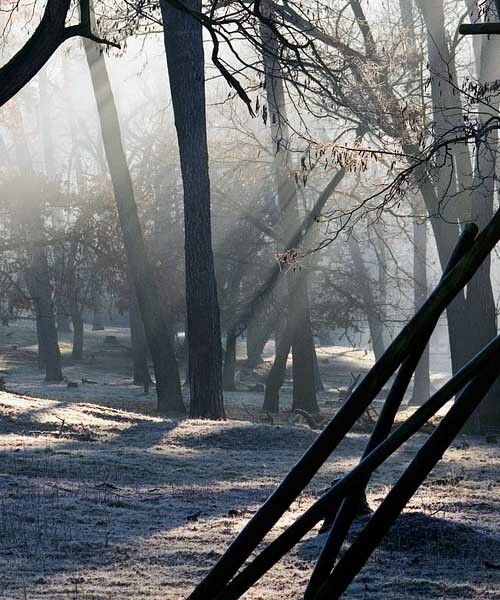 This means it follows the contours of your body, no matter position you are in. Unlike IWB and OWB holsters that usually protrude and poke you to constantly alert you that they are around the patented Urban Carry holster fits below your waistband in the same area as your jeans pocket. 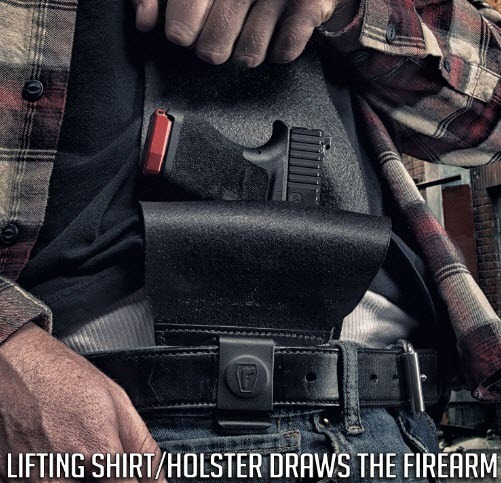 This means you won’t have to worry about having a holster digging into your hips. Because of its characteristics, you will hardly feel you are carrying a weapon, and everyone around you will also be none the wiser. Only the occasional prod of your gun as you sit down or stand up will remind you that you are armed. One important aspect of a holster that you should not overlook is how well it retains a gun – this is known as holster retention. Holster retention simply means the ability of a holster to keep a gun from falling out. I mean, you wouldn’t want your gun slipping out of the holster accidentally would you? Of course not. Urban Carry holsters take retention very seriously as no gun can fall out. In fact, when it comes to drawing your gun out of the holster, you actually draw out the holster. That’s just how secure your gun is in an Urban Carry holster. It’s holster retention at its best. 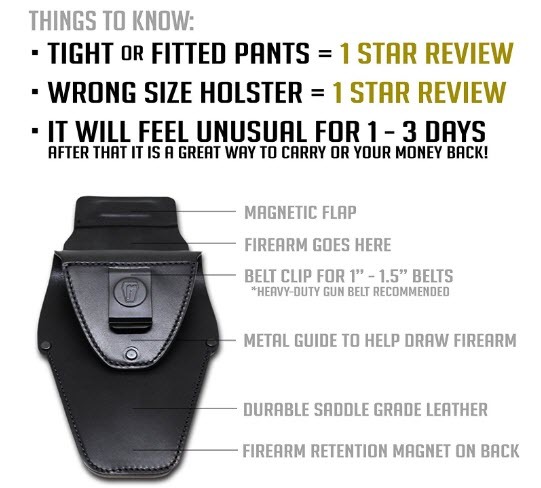 Because of the unique design that makes it a point to completely cover the gun and its position inside your pants, there is no way your gun can fall out by mistake, nor is it possible for someone to grab it out of the holster during a skirmish. The Urban Carry holster is the most secure holster in this aspect. By now you’re probably on the same page as many other gun owners who have made the right holster choice by going with an Urban Carry holster. That, my friend, is one of the best decisions you would have made, second only to your choice of gun.